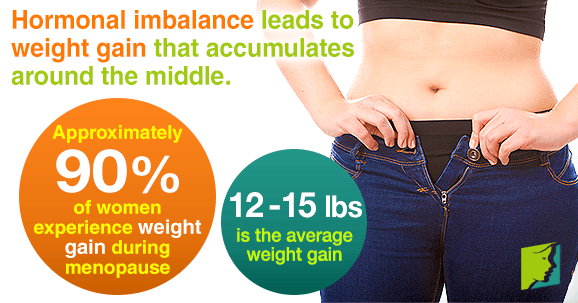 Most women are attuned to changes in their body weight, and are especially quick to notice weight gain. During her forties and fifties a woman's body undergoes hormonal changes that can affect a number of factors, including weight. Fast weight gain, that's otherwise unexplainable, most likely signifies menopause, especially if the weight accumulates around the stomach. Approximately 90% of women experience weight gain as they approach and undergo menopause, with the average gain being between 12 and 15 lbs. Keep reading to discover more about menopause, weight, and ways of limiting dramatic weight gain. There's a certain amount of inevitable weight gain that comes with the aging process in both genders. As a person grows older, their metabolism naturally slows and muscle tissues become thinner, which makes it more difficult for the body to burn calories. For women, however, the hormonal changes she undergoes between the ages of 40 - 55 can exacerbate this. A decline in estrogen levels can cause the body to gain fat mass and change the way fat is distributed. This often leads to weight gain that accumulates around the middle. While women of a child-bearing age tend to carry weight around their hips (i.e., 'pear-shaped') menopausal women tend to carry it around their waist and stomach (i.e., 'apple-shaped'). Other symptoms derived from hormone changes in menopausal women can also contribute to weight-gain. Fatigue and mood swings may influence a woman's appetite, dietary choices, and attitude to exercise. Hypothyroidism (i.e., an underactive thyroid) is another common condition in which weight gain is a key symptom. In terms of health risks, it's important to manage this extra weight gained during menopause - particularly if this weight is accumulated around the stomach - because body fat stored within the abdominal wall and around the internal organs (i.e., visceral fat) increases the risk of cardiovascular disease and type II diabetes. Weight-management is also important for a woman's well-being. Extra body fat is likely to affect not just her energy levels and physical fitness, but her body image and self-confidence too. Menopause brings with it a number of physical and emotional changes; it's important for a women to feel good about herself during this significant transition, and insecurities about weight gain can hinder this. While crash diets and other extreme forms of dieting may seem like quick-fix options, these are unhealthy, slow the body's metabolism, and ultimately make binge eating at a later date more likely. While it sounds like a cliché, the reality is that a low-fat, high-fiber diet with plenty of whole grains, fresh fruit, and vegetables; eating little and often; drinking plenty of water, and exercising five days a week for 30 minutes is the most effective path for consistent, healthy weight management. Spotting the early signs of menopause might be slightly upsetting or stressful, but it's best to deal with weight gain, and other menopause symptoms, practically to lessen their impact. Don't be downhearted; weight gain is not something you have to accept and live with. You can control your weight and shed extra pounds with a healthy diet and exercise at any age. Eat well, exercise regularly, and boost your confidence by getting a new haircut, socializing often, or learning a new skill.